There is no doubt that Match.com is among the most recommended and one of the Best Dating Sites in Canada.The matchmaker was released in 1995, and since then it has expanded to 25 countries catering thousands of singles from all over the globe. This top dating player has a simple mission: to connect Canadian single men and women who search for their ideal partner and dream about initiating a long-lasting relationship. Its popularity comes from its unique matchmaking algorithm. When singles register for free in Match.com have to fill a personality test. Results then are used to suggest potential partners. If you want to find out if this is the right dating site for you, check out our Match.com Review. How to delete your dating profile & Cancel your subscription? There are dozens of dating sites in Canada aimed at singles who want to find a serious partner. What makes Match.com one of the best options is its unique matchmaking system. To take the most of your time in this platform, the best is to understand how the personality test works, and learn how you can use the tools at your disposal to meet singles that really are of your interest. Signing up for Match.com is completely free. The first that you need to do is to fill out a short online registration form. You simply need to add some basic information including your location (your postal code), the type of partner that you are looking for in the platform, and your email address. Right after, you will be asked to take a personality test, and then create a profile where you can include more information about your interests, personal and romantic habits, and a brief description about who you are and what your relationship expectations are. You can also add some photos for free to make your profile more appealing. There is the option to skip some details, and then go to the section where you can browse through some personals. During the registration you can save some parts of your profile, and you can edit and add more information whenever you want to. We recommend you to spend some time creating your profile when you join Match.com, so after you can completely focus on getting in touch with other users. Your profile is divided into several parts. First, you need to tick some options where you are asked about some basics like your relationship status, search parameters, appearance, lifestyle or background. After that you would need to define your interests like your favourite movies, and write a small description about yourself and your perfect match. The second part comes in a form of a survey, but this time, it’s concerning your potential partner. To finish up, you are required to upload up to 26 photos, which must be verified by the dating site’s team of experts, and 24 hours later, you’ll be online meeting scores of interesting singles from your area. A free account enables users to search for profiles, view them but not to communicate with potential matches. Match.com is one of the largest dating sites in Canada, and it offers plenty of opportunities, but being part of this exclusive community of singles takes quite some time and effort. The registration process consists of a short form where you need to include a few details, and a personality test that takes some time to complete. However, it is in your own interest to solve the questionnaire as then, you are suggested matches based on the information you provide during the test. Match.com personality test includes questions that measure several aspects of your personality and defines your romantic profile. You are asked about some of your daily habits, the way you socialize with others, and about the way you deal when you are dating or in a serious relationship. Emotional and intellectual affinity plays a key role here! As a good matchmaker, this site recommends partners who are a perfect fit! The goal is to present you profiles that meet your romantic criteria. Undoubtedly, this is a site for those Canadians who expect to meet like-minded singles living nearby. The site uses your test results to propose you daily matches. The list is made of profiles of users who really share the same life values, and romantic expectations. While other dating site focus on connecting singles considering age and location, Match.com does it as well, but it also proposes couples who have as many things in common as possible. The idea is to present you single people who have a lot of potential to become your perfect partner! 27% are senior daters (over 52 years old). Online dating peak period for Match.com: 42% increase in registrations during December – Mid-February. Match.com app is a good alternative if you want to continue making connections while you are on the move. The mobile version is mucho more limited than the desktop one, but still gives you the opportunity to interact and meet other singles nearby. The dating app proposes a customized experience that combines the main features you can find in the original version. You can create and edit your profile, add and delete photos. There is the option to view your daily matches, and you can search and check other singles’ profiles. The mobile version includes a few tools to break the ice, show your interest and to interact with others. If you are attracted to another user, you can send him/her a wink or a private message. The instant chat is one of the key characteristics. The most interesting thing is that you can only read messages from users you are interested in. In such way, you don’t need to manually filter unwanted messages, spend time blocking users who you don’t like or receiving push notifications from people you are not attracted to. However, the star feature is the called “Mixer”. It basically is an entertaining matchmaker. In a way it works like Tinder. You are presented with profiles recommended by the Match.com’s dating experts, and you have to say if you are interested in that person or not. 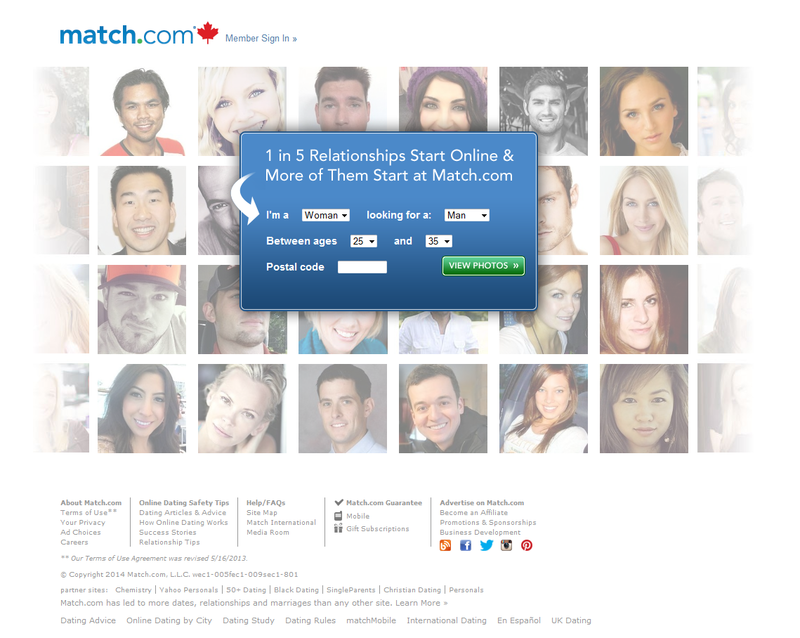 Despite Match.com app is not as complete as the PC version, it is worth a try, especially if what you like is to connect with other Canadian singles fast by playing in the “Mixer”. Match.com promises a safe and discrete space where singles in Canada can find a potential long-term partner. There is a mix of opinions about the services the site offer, but after trying them out, we have seen that the portal really takes very seriously the idea of creating couples who emotionally, intellectually and psychologically connect. The only objection is that you need to spend quite a lot of time at the beginning to create your profile and solving the personality test before start chatting with other singles. In that aspect, the site could be offering a more fast-paced process of registration. On the other hand, the fact that you have to go through all these stages during the registration is a sign that most people who are in the platform really are serious about the intentions of meeting someone for a serious commitment. Once you have completed the questionnaire, you can search for matches depending on your own criteria or Match.com can recommend you matches based on your personality test results. Use the search functions, which are really flexible and have been especially designed to get results. Make a copy of your messages. They are sent to your personal inbox. In Match.com, there are several subscription packages aimed at any kind of budget. Subscription periods span 1 month, 3, 6 or 12 months. The longer you stay in the platform as a subscriber, the less you will pay every month for your membership. It all depends on how much you are willing to spend on your online dating experience. Match.com is an international dating site that has gained popularity over the years. It has integrated several safety measures in order to protect the privacy of its users. The site offers verification badges to those users who confirm their profiles with their email, phone or social media accounts. These are visible to others to let them know that your profile is trustable. If you have a query about how the site works or want to report another user, you can get in touch with Match.com’s customer service from Monday to Friday (8:00 am – 5:00 pm) by filling a contact form. The team will respond within 48 hours. Alternatively, you can send an email to [email protected].match.com. There is a very handy FAQ section to solve any question you may have about your online dating experience in Match.com. In the site, you can also find a very useful guide about how to date safely. If you don’t want to continue being part of Match.com community, you can close remove your account at any moment. After doing so, you will receive an email to confirm the removal. The site then will remove your profile within 24 hours. In case you want to use the services in the future, you can always reactivate your profile. Your details then will be recovered. When you subscribe as Premium in Match.com, keep in mind that your membership is renewed automatically. Therefore, if you want to cancel your subscription, then you would need to go to the part in “My account Settings” that refers to managing your subscription. In there, you will find the option to cancel the auto renewal. You will receive an email to confirm that step. Match.com is a key player in the online dating industry. More than 20 years of experience in the field backs them up! You can be confident to find what you are looking for as new members are constantly signing-up and because Match.com has one of the biggest user base in Canada. If you feel that there are too many profiles you can easily narrow down the number of matches using match search tools. Enjoy a great and safe dating experience with this international dating site. If you’re looking for a date based on mutual interests and romantic expectations or want to embark on a serious relationship with another interesting and sophisticated Canadian, we highly recommend you to have a try in this dating site!